In case I haven't said it enough, Asana is one of my all time favourite productivity tools. 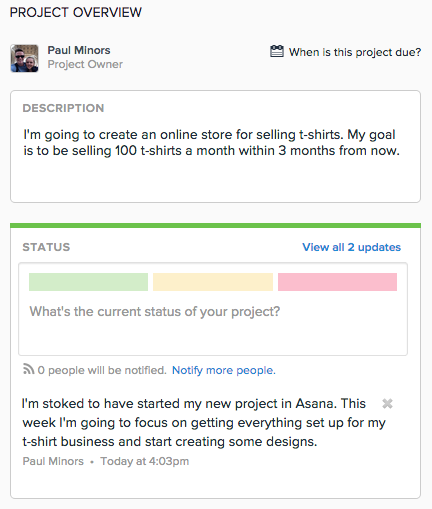 For those who are unfamiliar, Asana is a project management tool like no other. It's simple and easy to use, yet powerful and completely customisable. I recently wrote about why you should use Asana to manage your projects and wanted to follow up with a post about how to get started with Asana, but specifically for individuals. As you may know, one of the great benefits of using Asana is that it works really well in teams. No more sending unactionable emails, Asana keeps all conversations tied to actual work and decisions that need to be made. Using Asana in teams increases accountability among one another and you get a better sense of what everyone is working on. But what about individuals? A lot of people I recommend Asana to get the impression they can't use it if they're not using it within a team. Well I'm here to tell you that Asana is just as useful even if you're working on solo projects or your own side-business. I'm a sole-preneur building this little website all on my own and I use Asana to plan everything and manage my progress. Here’s how you as an individual can get started with Asana. After you create your free account, it's time to set up your first project. Have a think about the various projects in your life. What are you doing on an ongoing basis that could be more organised? Do you have a short-term goal that you’re working towards? What is the one thing you've always said you would do, but have never actually started? What ever you decide to set up as your first project, you’ll want to list everything that you need to do to complete that project by setting up all the tasks. This is really quick and easy in Asana. You just start typing on the top line and hit enter to move on to the next one. Don’t forget to list absolutely everything that needs to be done. Recall one of the basic principles of Getting Things Done (GTD); capture everything in one place and get it out of your head. Guaranteed you won’t remember everything. Once you’ve listed all these tasks, you can start to create some structure with sections. Sections are a very underused feature in Asana but are extremely useful. Sections serve as a visual way of organising similar tasks. 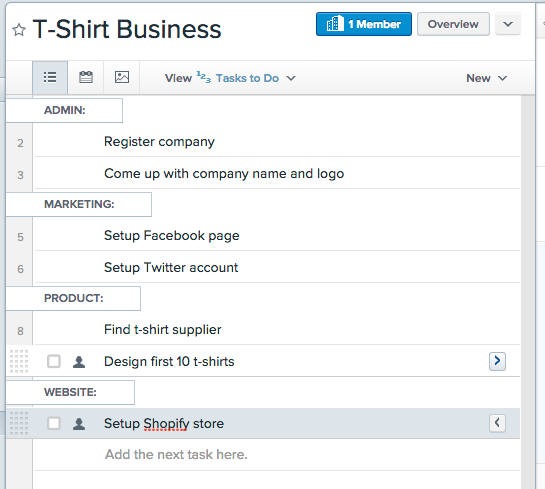 For example, when listing everything we need to do to set up a t-shirt business, you could group tasks into “Marketing”, “Product”, “Website” and “Admin” (to name a few). The next and one of the most important steps is to assign a due dates for all of these tasks. If you don’t assign due dates, there’s no sense of urgency and you’re far less likely to complete the task. When assigning due dates, have a think about which tasks need to be completed first before moving on to the rest. For example, coming up with the name of your t-shirt business should be done before you set up the Facebook and Twitter accounts. Or when you’re renovating a kitchen, you probably want to put the new appliances in before finishing the floor. The advantage of setting all these due dates in Asana is that it will build out a nice calendar for you. This is a great way of seeing what order everything needs to be completed in. It creates a sense of order and priority among the different tasks. As you become an Asana expert, you’ll probably set up more and more projects. And when you have multiple projects on the go, how do you know which tasks among all your projects are coming up next? That’s where “My Tasks” comes in. This page basically summarises all of your tasks across every project in one place. 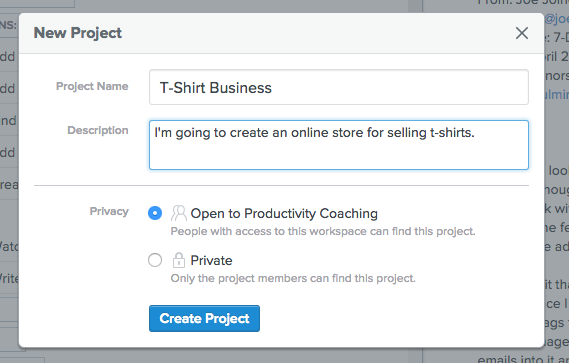 TIP: Have a task you want to add to Asana that doesn’t fit into any project? Just add it to “My Tasks”. No need to force it into a particular project if you don’t want. In “My Tasks” you can organise all of these tasks into various sections: “Today”, “Upcoming” and “Later”. Simply drag and drop to reorder your tasks. Similar to sections in a project, these sections serve as a visual way of organising your tasks based on priority (in this case, time). Anything in “Today” and “Upcoming” is kept in view, and tasks moved to “Later” are hidden so you don’t have to worry about them. The great thing about these sections, is that when you set up due dates, the tasks automatically move between these sections as they get closer to the deadline. So lets say you create a task for one month out and you mark this for “Later” because it’s not due for a while. About a week out from the due date, it'll pop up in “Upcoming” and you think “Oh yeah, forgot about that. I’ll work on that this week”. Then on the day it falls due, it automatically moves into “Today”. So when you open up Asana for the day, you get a nice list of everything you have to do that day. No more wondering “what am I going to do today”. Asana just shows you (assuming you’ve planned everything thoroughly). TIP: Why not set up sections in your “My Tasks”. For example, you could have a “WIP” section for “Work in Progress” or “Weekly Goals” where you outline your main objectives for the week. Even though you’re the only person on your team, make sure you assign everything to yourself so tasks show up in “My Tasks”. When you click on the “Overview” of a project, you can add a description and post product updates. Seeing as you're working on your own, you can use this space to outline the goal of your project and post updates like you're writing in a journal. This is a nice way of documenting your progress. Add supporting documents as attachments to keep everything you need in one place. 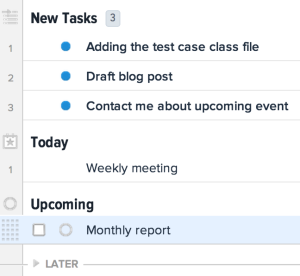 Use subtasks to add an extra level of structure to your tasks. I always challenge people to do something with the information I provide. So take this as an opportunity to start working on something you’ve been putting off for ages. When you do, I highly recommend using Asana to plan your next project. TIP: If you need help getting started with Asana, or if you want to get more out of Asana, I HIGHLY recommend you check out “Do Better with Asana” by Productivityists Mike Vardy and Jeremy Roberts.